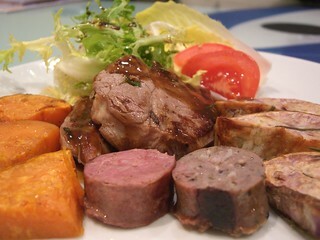 Lamb Loin Chops, Buffalo Sausage, Bull Boar Sausage, Roast Orange and Purple Sweet Potatoes, Frisée and Witlof. The lamb loin chops were so tender! It's a good thing I trimmed off the fat, so it wasn't too greasy. The bull boar sausages were very nice with cloves and other herbs to mask any gamey-ness. Quite lean too. Even leaner were the buffalo sausages. Quite gamey, but quite tasty too.